I’d been using the Alba Botanica Even Advanced Sea Kelp Facial Toner for a month before I decided I didn’t need it. I was using it alongside a bunch of products and wasn’t able to figure out if it was doing anything special for me. I got my answer once I stopped using it. Rather when I restarted using it. Due to snowy Chicago winters and my new retinol-aggressive regimen, my skin got so dry that even water running down my face stung. Old acne marks got redder and stood out like a sore thumb. It was then that I pulled out this toner from my no-repurchase drawer. In an effort to add an extra layer of soothing moisture to my skin, I started using it again. It was okay going on, in that it didn’t sting or anything. I carried on with my usual skin care on top. It was one of those evenings that something made me do a double take in the mirror. My face looked luminous and even! Very very even. No sign of redness. That was an aha moment for me. I understood what they meant by ‘Even Advanced’. This toner not only helps even out the skin tone over time, but also shows instant results. I also noticed that with it on, the rest of my skin care went on more smoothly and felt like it got absorbed into my skin better than before. So now I use this miracle water twice a day, morning and evening, and I couldn’t be happier with my regimen. It feels like this was the missing piece. I’d think that with sea kelp in it, it would be breakout city, but no. 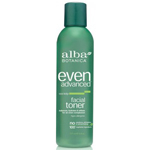 Alba Botanica Even Advanced Sea Kelp Facial Toner isn’t available on drugstore shelves. Not at Target, Walmart, Walgreens or Ulta. It is, however, available online, at drugstore.com . Check out its ingredient list, any comedogenic ingredients and reviews here: Alba Botanica Even Advanced Sea Kelp Facial Toner reviews.